Scientists suggest that physical symmetry is an indication of a healthy potential mate, and that our visual systems are wired to prefer symmetry. 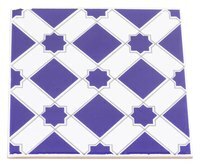 Our preference for symmetry has expanded from just mating, so we now consider straight walls more pleasing than lopsided ones; symmetrical floor coverings look good while misaligned tiling just looks wrong. Symmetry is reflection about a central point, so locating the center of a room is essential if you want symmetrical decor. The center of an irregular shaped room is not immediately obvious, so it must be calculated from measurements. Examine the room visually and decide which of the walls is the main wall. This is a wall that forms a focus point within the room, or one that aligns naturally with other features such as doors and windows. Consider this wall as your "base wall" from which you will make subsequent measurements. Measure 3 inches out from the base wall at either end, and snap a chalk line between the two marks. Have an assistant hold one end of the chalk line, or hold it in place with a tack pin. Stretch the line taut, lift the string about 4 inches, and let it snap back down with a "twang." The result is a chalk line on the bare floor parallel to, and 3 inches away from, the base wall. Measure the length of the wall, and divide by two to establish the center. Make a mark on the floor corresponding to the center point. For example, if the wall is 20 feet long, the center point is 10 feet from either end -- 20 / 2 = 10. Draw a line, a couple of feet in length, perpendicular to the line that is parallel to the base wall. Start at the center point and draw toward the middle of the room. Use a builder's square to ensure that the line is at exactly 90 degrees to the chalk line. Snap a second chalk line across the room so it forms a continuation of the line drawn in step 4. The result is a new chalk line that bisects the room from wall to wall. Measure the new bisecting line and divide by two to determine the center point. Mark this on the floor. This mark represents the effective center of the irregular shaped room. When selecting a base wall, choose one to which your eye is naturally drawn when you enter the room. Because your eyes will move from that wall to the rest of the room, your brain will assume that decoration and flooring start from that point, too. When dealing with irregular shapes, it is often better to go with what looks like the center rather than what is mathematically the center. For example, if the center line is slightly to one side of the center of a door opening, adjusting the center point to align with the door may produce a more pleasing result. FaceResearch.org: Why Are Symmetrical Faces Attractive? Live Science: Symmetry in Nature - Fundamental Fact or Human Bias?